via Open Culture. Part 2 here. With apologies, once again, for the light posting in the last couple of months. I hope to resume normal service in the New Year. See you on the other side of the cliff. which future president is this? In the wake of the Pearl Harbor attack on December 7, 1941, General Eisenhower travelled to Britain to form the "best Army" ever to wage war. This is him at the rifle range with Churchill. Via Michael Beschloss. (Those are Beschloss's words - "in the wake" - though actually Eisenhower didn't get to Britain until May 1942 according his official biography. Long wake, I guess). It's hard to imagine Mitt addressing this task with quite such relish. The White House has just released a bunch of behind-the-scenes photos from the pre-election period, including this one, from election night. 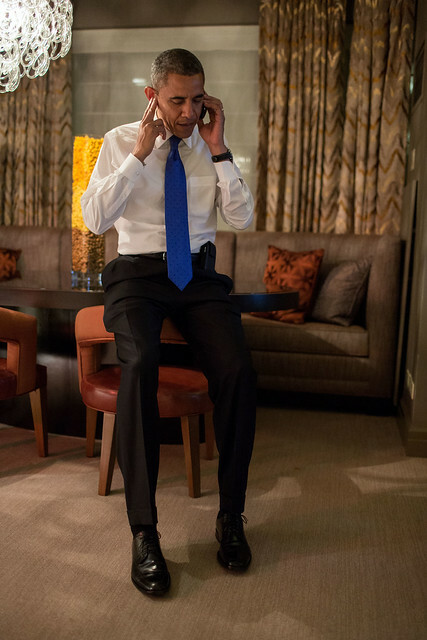 It shows the president taking Mitt Romney's concession call. The timing of this release is funny - it's almost as if the White House are seeking to remind the Republicans, with whom they are currently in fierce negotiations over the debt ceiling, of...something. Apologies for the light to non-existent posting these last few weeks: it's due to combination of holiday, other stuff taking up my time, and the lack of big US political news, save for fiscal cliff foreplay. This video was played at the Saban Centre for Middle East policy at a dinner in honour of the Secretary of State, on Friday night. It really does have the feel of a campaign film. It's topped and tailed by Tony Blair, who closes the film with the words, "I just have an instinct that the best is yet to come," (but was he talking about Hillary, or himself?). There's also a separate video from Obama, who pays generous - and convincingly delivered - tribute to his "great friend". This has convinced David Remnick, the New Yorker's editor, that Hillary's up for it in 2016 (though of course the truth is she's probably not sure, but is very much keeping that option open). I went to see Spielberg's Lincoln last week. It's actually a very un-Spielberg, un-Hollywood film, and not what I was expecting at all. Rather than attempting a full-on biopic (perhaps starting with a teenage Lincoln, sweating in the midday sun, splitting rails) or even telling the story of Lincoln's presidency, Spielberg and his team have opted to focus on five days early in Lincoln's second term, during he which he scrambled to pass the thirteenth constitutional amendment, outlawing slavery, through the House of Representatives (the Emancipation Proclamation had already passed; Lincoln wanted to embed it in constitutional law). The result is a movie long on political machinations and intricate legal arguments, and rather short on drama and emotion. Not that's it's totally lacking in the latter qualities but you do feel at times as though you're watching an unusually well-produced BBC or NPR historical re-enactment. I mean, I found it fascinating, most of the time, but even for someone like me, who actually enjoys reading about this stuff, it was hard not to drift away at times. Two excellent commentaries are worth reading: David Brooks writes beautifully about the movie's nuanced appreciation of the relationship between morality and politics. Adam Gopnik points out that although Lincoln is these days celebrated as a conciliator and compromiser, the point about him is that on the biggest issue of all - the Union, and thus slavery - he refused compromise (in fact there's a reasonable case to be made that he should have compromised - that he shouldn't have taken the nation to war). The film is ostensibly based on Team of Rivals, Doris Kearns Goodwin's comprehensive and popular account of Lincoln's presidency. This is puzzling to me, however, because Goodwin's book devotes no more than two or three pages to the passing of the thirteenth amendment. She clearly didn't regard it as a pivotal point in Lincoln's presidency. Team of Rivals doesn't even mention Thaddeus Stevens, who plays such a prominent role in the movie, or relate the story of the vote-getting in anything like such detail. So which other sources were Spielberg and his writer Tony Kushner relying on? And in what sense can Lincoln be said to be "based on" Team of Rivals? UPDATE - very interesting perspective on these questions from an historian. UPDATE ii: Also fascinating: interview with Tony Kushner.